You are here: Home » What Is the BEST Beer City in America? What Is the BEST Beer City in America? Charlie Papazian wrote an interesting article for the Examiner .com a couple of days ago asking people what the best beer city is for 2012. This got my head spinning as there are so many great beer cities out there as is evident from the map above (I know its a state map, but play along). They are also asking people to vote, but they have limited your selection. They say that the vote is based on community pride and perception, not just where great beer is made. I can hang with that, but c’mon there are a lot of great beer cities that didn’t make this list. Not to be provincial, but it is what I know and it is my blog, but I can’t believe that Boise didn’t make this list. It was recently rated as one of America’s top beer cities by Livability Magazine at number 7. It is home to the second largest Beer festival west of the Rockies (Portland being number one) and is quickly gaining a reputation as a great place for beer. Another perennial top 20 city for beer is Anchorage, AK. Nowhere on this list however. So this list limits you on which city you could vote for, but here at Beer and Whiskey Brothers, we will let you vote for any city you want to in the comments. Let us know what you think about Charlie’s list, and what cities you would add and why. Obviously you can’t have every city on a voting list like Charlie’s but perhaps he should have made sure each state had representation. Craft beer is getting huge and as it does, the great beer city lists should increase as well. Give us your vote for best beer city in the US. You can even give us more than one. Hell give us your top five or ten for that matter. What are your favorites? I don’t think my vote matters, hipster vote in Asheville every year…it is a stellar scene though. Didn’t like Deviant Dales? That just totally ruined my day. Yea it wasn’t that good…almost a sink pour. yeah, freakin’ hipsters! they got nothing better to do than to drink their PBR and vote multiple times! According to your criteria, I would say Asheville, not having been to Portland. Hopefully that will change next year. I would say that San Diego makes the best beers though. I need to get to Ashville one of these days. Sounds amazing. Obviously my homer vote goes to Indianapolis….but my educated, unbiased vote goes to San Diego. I’ve enjoyed Flat 12 and Sun King offerings and hard to deny Indiana as a whole with FFF and NABC. Very underrated state. There’s also a crop of new breweries doing really innovative things: Great Crescent out of Aurora, IN (canning in tall boys like SK but their Cherry Ale is a great gateway beer to sours), Black Acre Brewing with Green Tea Pale Ale and obviously Sun King bringing national exposure. Beer Bloggers Conference attendees will be quite pleased with what we have flying under the radar. Good point Tamre. My homer vote goes to Boise, but my “been there, done that” vote goes to Portland, the one in Oregon. The four cities in CO will cancel each other out. However, the fact that Colorado has the most nominated cities leaves very little question as to what the best beer STATE is, right? Alex, we’ve already had this discussion, and yes Colorado is a GREAT beer state. I may go Denver as a great beer city, however. Hard to deny the home of GABF its due. Alex, CO has a lot of great brewewries bit its also one of thosew super-sized western states. 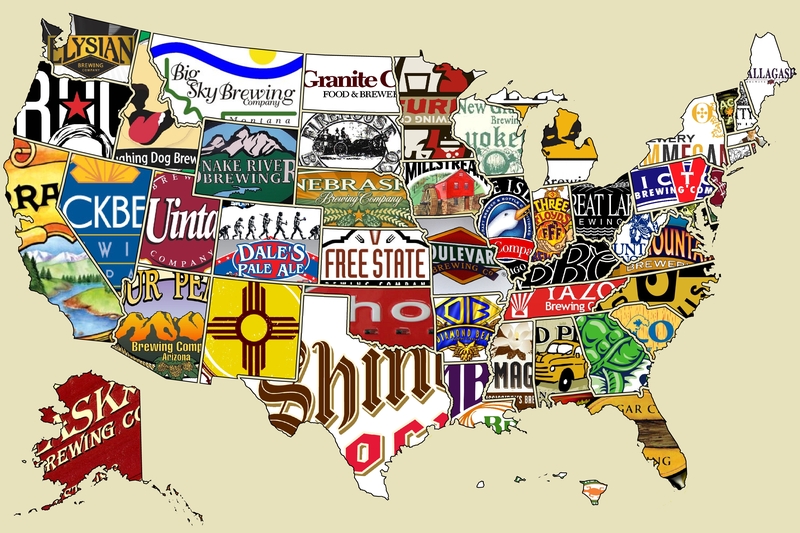 If you’re goinna pick a state that has the jmost top notch craftym breweries per capita VT and DE should top the list. How is Indy not on this list? Also, how is Burlington, VT not on this list? I think, someone check me, we have the most breweries per capita in Vermont. We have a heavy pub culture. There are bars that don’t even have MillerCoors or AB. Missoula? Seriously?Cincinnatti? I grew up in the Nasty Nati. There are 2, count them, 2 craft brewers. River City and maybe Crown Hill. Sam Adams doesn’t count. Good points all, Kenny. I agree this list has big holes that need to be plugged. For what it’s worth, Missoula had an excellent beer culture back in the 90s when I was in school, and from most accounts it hasn’t slowed since then. Its place on the list isn’t as crazy as you might think. It will probably lose by a huge margin anyway. Here’s my top 6, obviously very locale inspired but: 1. Portland (OR), 2. Boulder, 3. Anchorage, 4. Fort Collins, 5. Oregon Coast (that counts right? ), 6. Boise. My top 6 are based on beer from those cities, available in those cities, and the wonderful drinking establishments that I love in those cities. Good list Ryan, but I think if you spent any real time in Cali, there might be a city or two that makes your list. 😉 And I agree for ambiance no place beats the Oregon Coast. Gotta go with Philly! We may not know how to count (Philly Beer Week lasts 10 days), but between the breweries in the area and the fantastic and ever expanding Craft Beer bar scene, there is no question that Philly seriously represents when it comes to Craft Beer. Too bad Pennsylvania has such strange beer laws. I think that keeps Philly from breaking through as America’s best. Hopefully they will eventually sort all that out and allow Philly to really shine, as brightly as it can. And let’s not get started on their super weird liquor laws, i.e. the PA State Liquor Store monopoly. Not to be too biased, but Indy, Louisville, and Lexington all have better beer scenes than Cincinnati and I don’t think it’s that close. It’s not close. Louisville and Indy for sure outstrip Cinci. Not really sure why Cinci made the list in the first place. It is really an out layer. Must have had good representation in the initial voting? I’m wondering if Cincinnati is popular due to the two major sports team markets? So they drink A LOT of beer, and made the cut due to the amount of beer consumed? It’s really about craft beer, not just gallonage. If that were the case I’m sure Las Vegas would have made the list along with Dubuque, Iowa. Then I have no idea how Cincinnati made the list. If we are going to dissect the list, I have no idea how Dallas/Fort Worth made the list either. From what everyone has said to me DFW, and most of Texas with the possible exception of Austin and Houston has a really bleak beer scene. Agreed. Cincinnati has Rivertown, Christian Morelein and Mount Carmel, but I’m not expecting big things from Southwest Ohio until a year or two from now. Philadelphia, no doubt, and here’s how our antediluvian alcohol laws even benefit the beer scene: in Pennsylvania, you can either buy beer by the whole case at a distributor, or by the overpriced six-pack at a restaurant with a liquor license. For a distributor, though, unlike a conventional liquor store, there are no vendor reps and there is little ongoing cost associated with a case on the shelf in a warehouse. There’s no competition for linear feet of shelf space or a mandate to be at a certain height on the shelf. As long as the distributor can eventually sell that case, he can make money from it. It’s a great system for small brewers and we have lots of them. Yeah, but who wants a case of a single beer? (unless you are my brother and that beer happens to be Troeg’s Mad Elf or New Holland Dragon’s Milk). I rarely even buy six packs, and contrary to popular perception, I don’t go out that much either. If I lived in Philly I’d constantly be driving to Jersey to get singles to sample new brews. For clarification about how the cities were chosen since I’ve been following this since Charlie started the nomination process this year, the nomination process went as follows: The top vote getters from last year were automatically included in this year’s list; He then sent out a call for people to nominate cities that weren’t currently on the list, the ones most nominated then were added. My vote has to go with Alex on this for our hometown scenes. Anyone who hasn’t been to Denver in the past two years doesn’t know what we have. Not only are there new breweries popping up on what seems like a daily basis, but we also have a plethora of taphouses and beer-centric gastopubs. Boulder, Fort Collins, Boulder, and even Durango are also huge beer towns that can compete with any place nationally. And Boulder is so good you said it twice! 😉 I agree with you Will, it is very hard to find a better beer city nationally than Denver. Silly me! I guess my subconcious is trying to tell me something. I still have to take advantage of an invitation from Twisted Pine to go up, not to mention Avery and all of the other great breweries there. I assume this is really the battle for 2nd best behind Madison, although it was nice of them to include Madison in the voting to maintain the illusion that others might be as good. I’m sure you are correct John. How in the world is Washington DC a better beer city than Baltimore! No list will ever be complete and make everyone happy. There was a period of voting last month for nominations to go on the official ballot. That’s how Charlotte and Raleigh joined Asheville on the list this year. So any omission from this list is due only to a lack of support in the first phase of voting. I’ve read all kinds of reasons why the Beer City poll doesn’t matter or is stupid because one city is just better at getting out the vote and it’s not a reflection of anything about the beer culture there. That’s fine, except it is a reflection—it shows a large number of people in and around that city support the local beer scene and want to see it get the spotlight they feel it deserves. There are plenty of cities larger than Asheville in terms of the number of breweries, volume of beer produced, and several other stats. What can’t be denied is the size of the beer community in relation to the town’s size and the way that the craft beer culture is engrained into the city. That said, the poll doesn’t mean that each and every city can’t have an awesome and unique beer scene, and I look forward to visiting many more in the coming years. My local vote has to be split in the following order: Frederick MD, Baltimore & Philly (DC ain’t even in the running.) My true vote is also split: in the East–Burlington VT, in the West–Denver. Asheville. Greenman and Pisgah put out some great beer. Of course, you get some strange looks if youre wearing a collar and don’t have a beard or dreds. Great beer city nonetheless. Have you made it over to Crooked Fence yet? I was in last week, talking with Andy (I think was his name). They opened a few months ago and have stayed really busy. He says they are in the process of renting an adjacent unit in the stripmall and building an outdoor patio between the two units. It’s a really neat little taproom. They have $3.50 pints, with $6 12-oz pours of their specialties (unfortunately, none were available when I went). You can see all the equipment from the bar, and it seems like there’s always something going on. Andy used to work for Widmer, New Belgium, and, most recently, Hayden Beverage. He’s got distribution in the Old Chicago locations and had a tasting at the Co-Op last week. I was just wondering if you’d been over there yet, and if so, what your impressions are. P.S. How’s that Nampa endeavor coming along? Something tells me that Utah may be one of the few states that severely handicaps producing a ‘Beer city’ for both numerical and cultural reasons. Yet on the other end of the spectrum is neighboring Nevada, which permits gambling halls and bordellos but didn’t make the list either. I can think of few other motifs where a good beer would be so well suited. I think I’ll cast my vote for…. Belt, Montana. Every home and business is within walking distance of a micro-brewery (OK, the only one). Annual production is an impressive five barrels for every man, woman, child and dog in the city as well. What other place can come close to making such a claim? There simply is none. Great beer city implies a great beer, please name one great beer from Boise. come on Missoula has a better beer scene than Boise. I can’t believe Burlington Vermont would not be on this list. I always love seeing that map and seeing Free State Brewing represent Kansas while Nebraska Brewing Co holds down Nebraska’s spot.